Our teachers teach in the tradition of Luangpor Teean Jittasubho, and are associated with both the Mahasati Insight Meditation Association in MA, and the Redding Center for Meditation in CT.
Weekly classes are typically led by Michael Bresnan, Ph.D. Periodically, classes are also led by our Spiritual Director, Achan Da, and Assistant Director, Achan Niphen. Michael has been practicing Mahasati Insight Meditation for over 20 years. 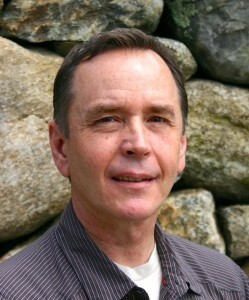 He is a licensed psychologist and is founder of the Mahasati Insight Meditation Association and the North Shore Center for Mindfulness, both located in Beverly and Gloucester, MA, and the Redding Center for Meditation/Wat Sati-Ma, located in Redding, CT.
Michael was born in 1958. While in his twenties, he began to investigate Buddhist meditation as a means to alleviate existential suffering. He studied Zen for several years, before turning to Mahasati Insight Meditation, which he encountered in 1991 after meeting Tavivat Puntarigvivat, a lay student of the Thai meditation master, Lunagpor Teean Jittasubho. In 1992, Michael began studying more intensively with visiting Thai Forest monks, Achan Thong Abhakaro, Achan Da Nilpant, and Achan Niphen Nontamart. Michael quickly realized the value of Mahasati Insight practice and has had a leading role in the introduction of Luangpor Teean’s teaching and practice to the West. Achan Da was born in 1951 in Nonsawang village, Roiet Province, in the northeast of Thailand. After being ordained at Supararam Forest Monastery in 1971, he searched out Luangpor Teean based on his growing reputation as an enlightened teacher. Achan Da didn’t actually find and meet Luangpor Teean for 2 years. But, once he did, he studied under his personal guidance for 3 years, practicing patiently and diligently, until he reached the end of suffering. Luangpor Teean then encouraged Achan Da to teach throughout Thailand and they worked together until Luangpor Teean’s death in 1988. Achan Da emigrated to America in the late 1990’s where he has been teaching ever since. 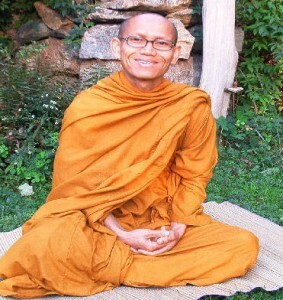 Achan Nipen Nontamart is also an ordained Thai Forest Monk, and has been practicing meditation for over 25 years. He was also a student of the Thai meditation master, Luangpor Teean Jittasubho. 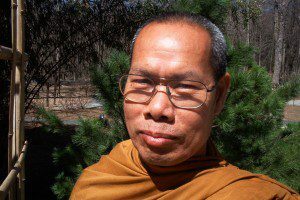 Achan Niphen serves as Abbot of the Janlan Forest Monastery in the northeast of Thailand, and as Assistant Abbott of both Wat Sanamnai near Bangkok, and the Redding Center for Meditation/Wat Sati-Ma, in Redding, CT.